Nutritious indulgence. I love those two words together =). That’s just what this oatmeal is. It’s anti-oxidant rich from the oats, nuts and cocoa, full of calcium from the milk, packed with fiber from the oats, then you get a bit of protein from the nuts. The indulgence obviously comes from the chocolate chips, marshmallows and sugar (an extra indulgence would be to top it with half and half mmm). 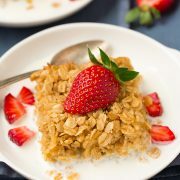 I won’t lie, it’s hard to make oatmeal look appealing but I think once you top it with the right amount of goodness, a hard task can become quite simple. 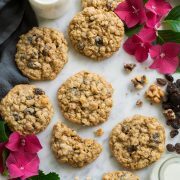 You could delight a loved one this upcoming Valentines day buy serving up this decadent oatmeal (and they’ll never how to know how simple it was to make =). 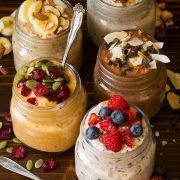 I know I’ve posted quite a few oatmeal recipes lately. I just can’t get enough of it though. I love how simple it is to mix things up and create new flavors, not to mention how easy it is to prepare. This recipe is dedicated to my mom =). My entire life growing up she’d eat a bowl of oatmeal every morning along with a side of broccoli, ughh. You’re probably thinking wow what a nutritious breakfast, yes it was until she’d mix in a half of cube of butter into it, literally half a cube. I’m glad you don’t do that anymore mom we need you around many more years, here’s a much better alternative to that for a delicious way to enjoy oatmeal =). Chocolate for breakfast, yes please! 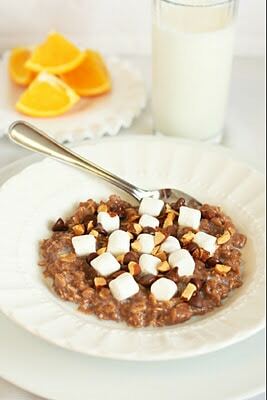 This is such a tempting way to prepare oatmeal. 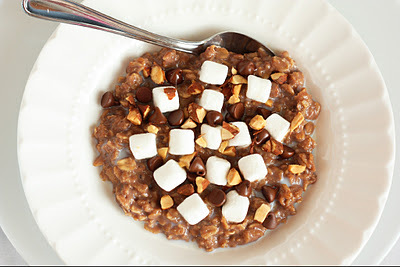 In a large microwave safe bowl, combine oats, milk, brown sugar, cocoa powder and salt. Microwave on high for 3 1/2 minutes. Allow to rest 2 minutes then remove from microwave and stir in vanilla. Top with nuts, marshmallows and chocolate chips, serve warm.